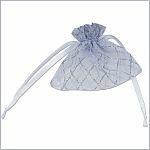 Pack fo 10 - White organza pouches. Add that special touch to your party favours by placing them in these lovely organza pouches decorated with a glittery diamond striped pattern. Europe & International shipping is EXTRA.